The following diagram gives the formula for charge and current. Scroll down the page for more examples and solutions on how to use the formula. • Calculate the charge flow in a circuit. • Describe what is meant by an electric current. • Calculate charge from current or current from charge. Electric charge is measured in Coulombs (C). 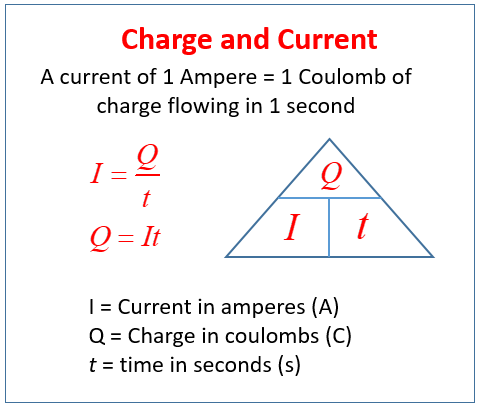 A current of 1 Ampere = 1 Coulomb of charge flowing per second. The size of the electric current is the rate of flow of the electrical charge. 1. Given that the current is 0.3A, calculate the charge flowing in the circuit in 20 seconds. 2. 360 C of charge flows around a circuit in 400 s. Calculate the current in the circuit. 1. A current of 2A flows through a bulb for three minutes. Calculate the amount of charge that flows through the bulb in this time. 2. A charge of 5kC flows through a variable resistor in two minutes. Calculate the reading on the anmeter which is connected to the circuit.